The Pitt wrestling team is still making its way through the early part of its season, but on Tuesday, head coach Jason Peters signed five Pennsylvania natives for the 2017-18 season. Nino Bonaccorsi, Dallas Bulsak, Colin Cronin, KJ Fenstermacher and Cole Rickert all committed to Pitt during the early signing period and will compete as Panthers next season. Bonaccorsi is currently a senior at Bethel Park High School, about 12 miles south of Pitt’s campus. In the fall, he’ll be following his brother Nick Bonaccorsi to Pitt. Nick was a three-time NCAA qualifier who graduated last year with a 72-48 career record. Bonaccorsi is expected to compete in the 184-pound weight class. He is ranked No. 3 in FloWrestling’s 2016-2017 national rankings of 182-pound high school wrestlers. He holds a career record of 108-20, and he was the 2016 WPIAL champion and the 2016 PIAA runner-up. 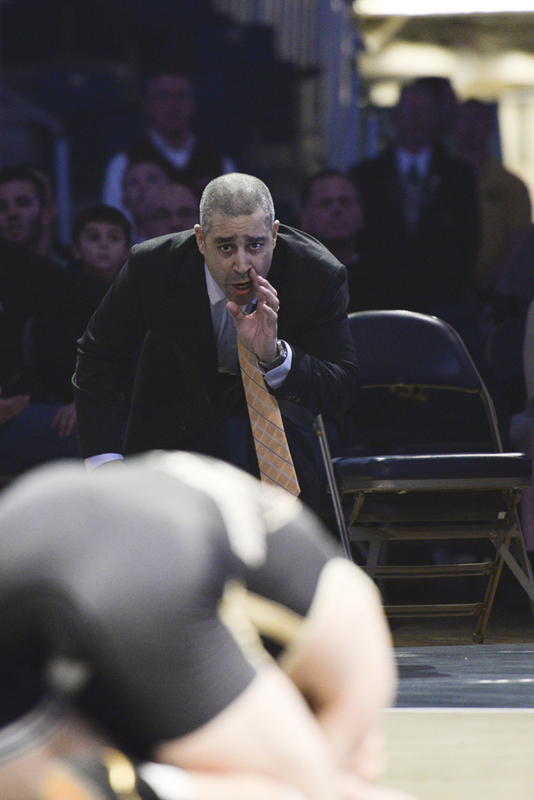 Bonaccorsi also wrestles for the Pitt Bull Wrestling Club and the Pittsburgh Wrestling Club. “I really liked Pitt because I am able to double leg people then walk down the street and get a Primanti’s sandwich,” Bonaccorsi said in the release. Growing up not too far from Bonaccorsi is signee Bulsak from South Park, Pennsylvania. Bulsak currently holds a 63-20 record. Although he wasn’t able to compete his sophomore year of high school because of an injury, he was the 2014 WPIAL champion and placed third in the WPIAL in 2016. Bulsak, ranked eighth in the state, is anticipated to compete in the 141- or 149-pound weight class. “Growing up in the Pittsburgh area with a group of guys I’m very comfortable with presented me with an easy college decision,” Bulsak said in the release. Cronin was recruited from the other end of the state, near Philadelphia. The Drexel Hill native is also expected to compete in the 149-pound weight class and is ranked No. 20 by FloWrestling. Competing at 138-pounds, Cronin is a two-time section and PIAA District 1 West champion, finishing fourth in the state last year. “I chose the University of Pittsburgh because it made me feel comfortable, safe and appreciated,” Cronin said. Also from Eastern Pennsylvania is recruit Fenstermacher. His current record is 120-13, placing the 126-pound wrestler No. 20 on InterMat’s rankings, another wrestling rankings website. Fenstermacher finished third in the PIAA last year and is a two-time District 11 champion. He is likely to compete in 133-pound weight class. “Pitt is it because I feel the coaching staff has what it takes to push me to become an All-American and NCAA champion. I also chose Pitt because the feeling I get when I’m in the city is second to none,” Fenstermacher said in the release. The final recruit, Rickert, is the biggest in Pitt’s incoming class so far. Rickert holds a 97-38 career record and is expected to wrestle in the 285-pound heavyweight class. Hailing from Transfer, Pennsylvania, he is a three-time state qualifier and has placed twice in the competition. Rickert is also a two-time regional champion and placed seventh at the 2015 FloNationals, an invitational held by FloWrestling for top wrestlers around the country. Like soon-to-be-teammate Cronin, Rickert is also an honor student at his high school. “I think Pitt will be a great opportunity to advance both my wrestling and academic career,” Rickert said in the release.